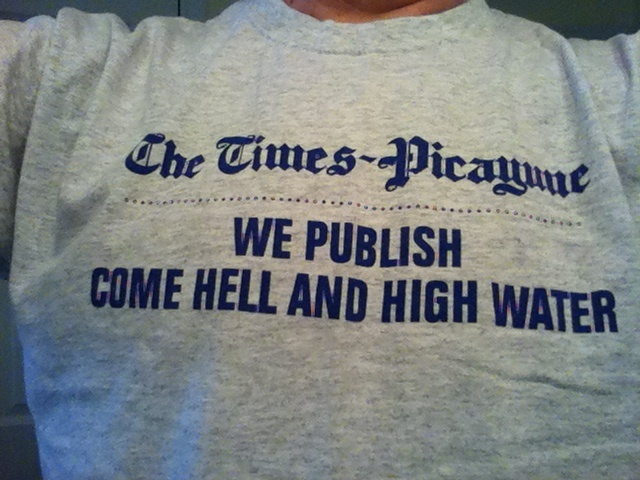 I couldn’t comment right away on this week’s announcement that the New Orleans Times-Picayune is cutting print frequency back from daily to three days a week. In part I waited because I was finishing timely posts on copy editing and student media and doing some other work, but I could have set things aside to weigh in on the New Orleans news. I waited mostly because I wanted to reflect on this a while. The New Orleans Times-Picayune will always hold a special spot among journalism heroes because of its staff’s performance in covering Hurricane Katrina. I have a personal fondness for the Times-Picayune journalists, recalling their support for my staff in Cedar Rapids when we experienced and covered our flood of 2008. I always ache when a newsroom staff is cut, and this is a severe cut, following earlier severe cuts. Advance Publications deserves praise for continuing its commitment to the New Orleans community during and after Katrina.